For ither uises, see Kensington (disambiguation). Kensington is a destrict o wast Lunnon, Ingland, athin the Royal Borough of Kensington and Chelsea. Its commercial hert is Kensington High Street. This affluent an densely populatit aurie conteens the well-kent museum destrict o South Kensington. Tae the north, Kensington is bordered bi Notting Hill an Holland Park; tae the east, bi Brompton an Knightsbridge; tae the sooth, bi Chelsea an Earl's Court; an tae the wast, bi Hammersmith an Shepherd's Bush. The aurie is first mentioned in the Domesday Book o 1086, whaur it wis written in Laitin as "Chenesitone", which haes been interpretit tae hae oreeginally been "Kenesignetun" (Kenesigne's land or meadaes) in Anglo-Saxon. 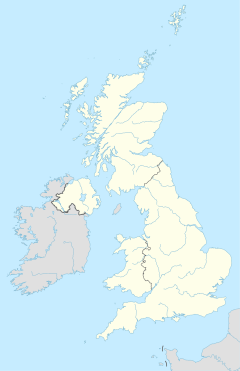 The manor o Kensington, Middlesex, wis grantit bi William the Conquerer tae Geoffrey de Montbray or Mowbray, bishop o Coutances, ane o his inner circle o advisors an ane o the walthiest men in post-Conquest Ingland. He in turn grantit the tenancy o Kensington tae his vassal Aubrey de Vere I, who wis hauldin the manor in 1086, accordin tae Domesday Book. The bishop's heir, Robert de Mowbray, rebelled against William Rufus an his vast barony wis declared forfeit. Aubrey de Vere I haed his tenur convertit tae a tenancy in-chief, hauldin Kensington efter 1095 directly o the croun. He grantit land an kirk thare tae Abingdon Abbey at the daithbed request o his young eldest son, Geoffrey. As the Veres became the earls o Oxford, thair estate at Kensington came tae be kent as Earls Court, while the Abingdon land wur cried Abbots Kensington an the kirk St Mary Abbots. The focus o the aurie is Kensington High Street, a busy commercial centre wi mony shops, teepically upmercat. The street wis declared Lunnon's seicont best shoppin street in Februar 2005 thanks tae its range an nummer o shops. Housomeivver syne October 2008 the street haes facit competeetion frae the Westfield shoppin centre at White City. The heritage bus service on route 9, uisin Routemasters, wis extendit tae Kensington High Street in November 2010 at the Council's urgin, pairtly tae boost the nummer o visitors tae the High Street. Kensington's seicont activity centre is South Kensington, whaur a variety o smaw shops are clustered close tae South Kensington tube station. This is the soothren end o Exhibition Road an aw, the thoroufare that serves the aurie's museums an eddicational institutions. The edges o Kensington are no well-defined; in pairticular, the soothren pairt o Kensington blurs intae Chelsea, which haes a seemilar airchitectural style. Tae the wast, a transition is made athort the West London railwey line an Earl's Court Road further sooth intae ither destricts, whilst tae the north, the anerly obvious dividin line is Holland Park Avenue, tae the north o which is the seemilar destrict o Notting Hill. 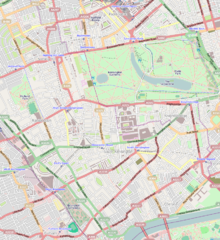 In the north east, the lairge Royal Park o Kensington Gardens (contiguous wi its eastren neebour, Hyde Park) is an obvious buffer atween Kensington an auries tae the north east. The ither main green aurie in Kensington is Holland Park, juist north o Kensington High Street, whilst Kensington haes numerous smaw residential gairden squares. While South Kensington can be regardit as a pairt o Kensington, the destricts o North Kensington an West Kensington are regardit as distinct frae Kensington. North Kensington is separatit frae Kensington bi Notting Hill. West Kensington is separatit frae Kensington bi the West London railwey line. Kensington is, in general, a extremely affluent aurie, a trait that it nou shares wi its neebour tae the sooth, Chelsea. The aurie haes some o Lunnon's maist expensive streets an gairden squares, includin Edwardes Square, Earls Terrace – a exclusive redevelopment o Georgian Houses, The Phillimores, an Wycombe Square – a new big development done tae a vera heich staundart. In early 2007, hooses sauld in Upper Phillimore Gardens for in excess o £20 million. Addeetionally, maist neebourin destricts are regardit as exclusive residential auries, includin Knightsbridge an Brompton tae the east an the nearest pairts o Notting Hill tae the north. Tae the wast is the less affluent but up-an-comin aurie o Earl's Court. Kensington is vera densely populatit an aw; it forms pairt o the maist densely populatit local govrenment destrict (the Royal Borough of Kensington and Chelsea) in the Unitit Kinrick. This heich density is no formit frae heich-rise biggins; insteid, it haes come aboot throu the subdiveesion o lairge mid-rise Victorian an Georgian terracit hooses (generally o some fower tae sax floors) intae flats. Unlik ither pairts o the Borough, Kensington itsel haes amaist nae heich-rise biggins – the exception bein Holiday Inn's London Kensington Forum Hotel in Cromwell Road, a 27-storey biggin. Notable attractions an institutions in Kensington (or South Kensington) include: Kensington Palace in Kensington Gardens, the Royal Albert Hall opposite the Albert Memorial in Hyde Park, the Royal College of Music, the Natural History Museum, the Science Museum, the Victoria and Albert Museum, Heythrop College, Imperial College, London, the Royal College of Art an Kensington and Chelsea College. The Olympia exhibition haw is juist ower the wastren mairch in West Kensington. Kensington is pairt o the Royal Borough of Kensington and Chelsea, an lees athin the Kensington pairlamentar constituency. The heid office o Daily Mail and General Trust is locatit in the Northcliffe House in Kensington. In addeetion tae hoosin the DMGT heid office, the biggin hooses the offices o The Independent series, Daily Mail, Mail on Sunday, Evening Standard, an Metro an aw. Sonangol Leemitit, a subsidiar o the Sonangol Group, haes its heid office in the Merevale House in Kensington. 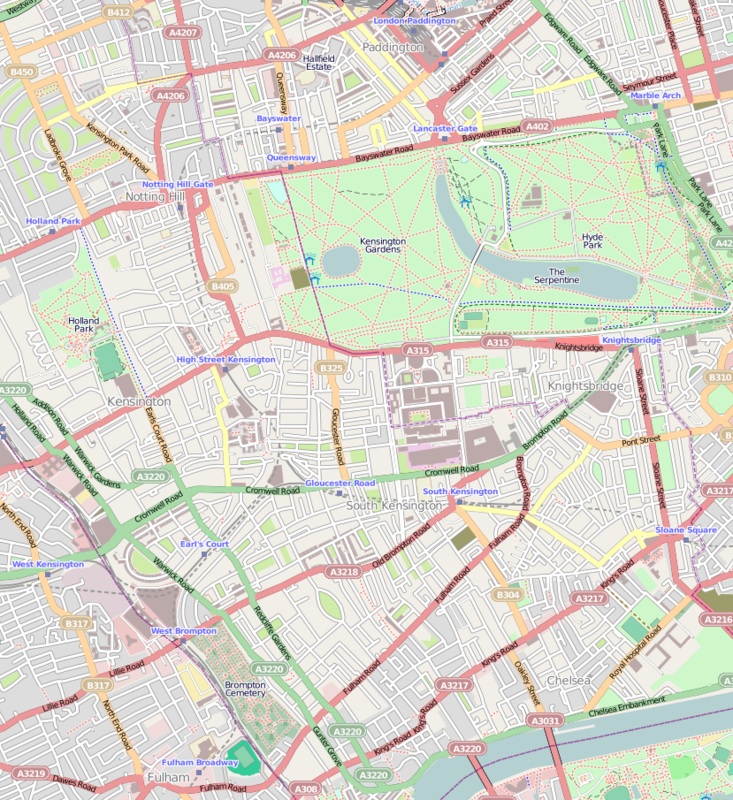 Kensington is crossed east-wast bi three main roads, the maist important o which is the A4 or Cromwell Road which connects it tae baith Central Lunnon an Heathrow Airport. Tae the north is the maistly parallel Kensington Road (o which Kensington High Street forms a lairge pairt), linkin central Lunnon an Hammersmith tae the aurie. Tae the sooth is Fulham Road, which connects South Kensington wi Fulham tae the soothwast. North-sooth connections are no as well-developit an thare is nae obvious single north-sooth route throu the aurie. A nummer o local bus services link Kensington intae the surroondin destricts, an key bus hubs are Kensington High Street an South Kensington station. Thir bus services wur impruivit in frequency an spread in 2007 tae complement the wastren extension o the Lunnon congestion chairge aurie, which required vehicles drivin intae or aroond Kensington in chairgin oors Monday-Friday tae pey a daily fee o £8. The extension o the congestion chairgin aurie wis athdrawn at the end o 2010. ↑ "Best shopping street' in London". BBC News. news.bbc.co.uk. 23 February 2005. Retrieved 2008-10-23. ↑ "Core Strategy:Putting the neighbourhood first". Royal Borough of Kensington and Chelsea. Retrieved 2010-05-14. ↑ "All aboard as Routemaster returns to Kensington High Street". Royal Borough of Kensington and Chelsea. 16 November 2010. Retrieved 5 January 2011. ↑ "Contacts." Daily Mail and General Trust. Retrieved 6 September 2011. "Northcliffe House 2 Derry Street London W8 5TT Great Britain"
↑ 8.0 8.1 Ponsford, Dominic. "Sharing with Mail 'will safeguard future of Independent'." Press Gazette. 28 November 2008. Retrieved 6 September 2011. "Under a deal signed today, the Independent titles will share back office functions with the Daily Mail, Mail on Sunday, Metro and Evening Standard at Northcliffe House in Kensington." ↑ "Contact." Sonangol Limited. Retrieved 6 August 2011. "Sonangol Limited Merevale House Brompton Place London SW3 1QE United Kingdom." "Kensington". Chambers's Encyclopaedia. London. 1901.